Did you catch the reciprocal nature of faith as described in this verse? Those who believe in God also believe God rewards them for seeking Him. Loving Jesus enables us to receive His love. John 14:21 says, “Those who love me will have my Father’s love, and I, too, will love them and show myself to them” (GW). Let’s look at ways to enhance our love relationship with God. Prayer demonstrates a relationship with God and faith that He is good. Ask and it will be given to you; seek and you will find; knock and the door will be opened to you.For everyone who asks receives; the one who seeks finds; and to the one who knocks, the door will be opened.. Which of you, if your son asks for bread, will give him a stone? Or if he asks for a fish, will give him a snake? If you, then, though you are evil, know how to give good gifts to your children, how much more will your Father in heaven give good gifts to those who ask him!” (Matt. 7:7-11 NIV). Gratitude demonstrates faith in God’s goodness and sovereignty. 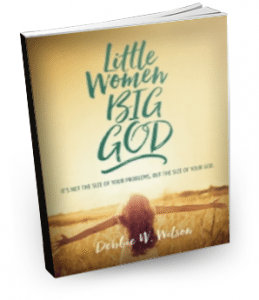 It shows I believe He is bigger than my mistakes and the wrongs I’ve endured (Rom. 8:28). Faith allows me to pray with thanksgiving before I see the answer (Phil. 4:6-8). Whatever happens, give thanks, because it is God’s will in Christ Jesus that you do this” (1 Thes. 5:18 GW). Worship shows we believe He is worthy of our devotion and reminds us He’s bigger and higher than anything else clamoring for our time and attention. Step out of the traffic! Take a long, loving look at me, your High God, above politics, above everything” (Ps. 46:10 The Message). Obedience demonstrates the authenticity of our love and faith (Heb. 3:18-19). Whoever knows and obeys my commandments is the person who loves me” (Jn. 14:21 GW). If you love me, you will obey my commandments. I will ask the Father, and he will give you another helper who will be with you forever” (Jn. 14:15-16 GW). In fact, this is love for God: to keep his commands. And his commands are not burdensome” (1 Jn. 5:3 NIV). Appreciating forgiveness shows faith in Jesus and increases our love for Him (1 Jn. 1:9, Titus 2:14). I tell you, her sins—and they are many—have been forgiven, so she has shown me much love. But a person who is forgiven little shows only little love” (Luke 7:47 NLT). Faith is the love language through which we express love to God and experience love from Him. Faith in God’s grace helps us get up after we’ve failed. And every time we get up, take a step, or be still from faith, God’s heart sings! 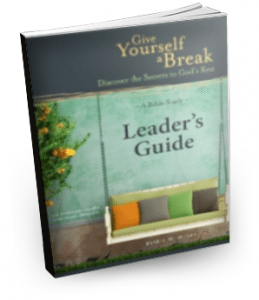 Does your relationship with God need a boost? Consider the list above. Which one needs your attention? Question: What helps you express and receive God’s love? I love God with all my body and soul, In my journey, as a Christian, I have sought His most perfect will for my life, Now, at 69 years old, I see my life as a failure. I contine to trust God, oftentimes in blind faith snd obedience. Dianne, I don’t know why you see your life as a failure. But let me remind you what Paul wrote in 1 Cor. 4:3-5 ” I care very little if I am judged by you or by any human court; indeed, I do not even judge myself. My conscience is clear, but that does not make me innocent. It is the Lord who judges me. Therefore judge nothing before the appointed time; wait until the Lord comes. He will bring to light what is hidden in darkness and will expose the motives of the heart. At that time each will receive their praise from God.” If you’ve failed, confess it and accept God’s cleansing and more on. If you are feeling condemned, that comes from the enemy, not from God. Rom. 8:1. Debbie these are absolutely wonderful! For me, personally, I always seem to relate everything to being a parent since that has been the most precious experience of my life. I know no matter what my children or now grandchildren could ever do – no matter how awful – it could never make me stop loving them or stop trying to do everything in my power to help them. If that’s how I – as imperfect as I am – feel, then I can just trust totally in God’s unfailing, unconditional love for me. Ann, that is a beautiful example and a biblical one! Thank you so much. LOVE THIS: “Faith is the love language through which we express love to God and experience love from Him, “!!!! Fuller, I loved thinking about this. I want to keep pondering it. Love to you! Marilyn, I remember that song and love it. What great words! Thanks for reminding me. I hear it in my mind. I like this idea of God’s love language. I’m your neighbor over at #TeaandWord. I love how you applied the love languages to God. I never thought about how I show my love to God and I love the 5 ways you mention. That came to me last week, and I enjoyed thinking about it. Thanks, Valerie. Faith is a great love language. Thanks for putting it into these terms, Debbie. I do love the Five Love Languages, but putting this into a vision of how we love God is also very valuable! Thank you, Lisa. I found it fun to think about what is God‘s love language. I love this! 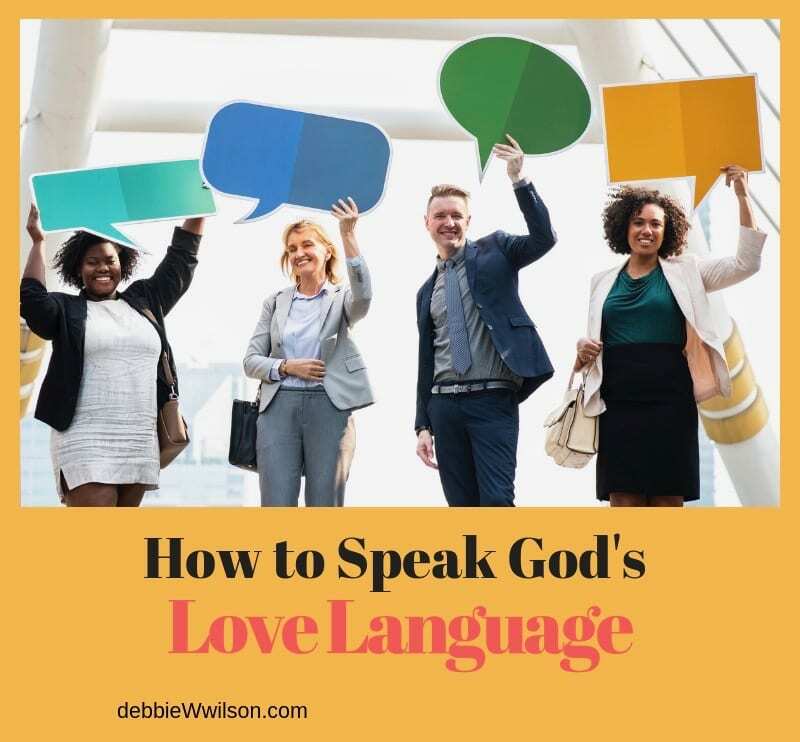 Sadly, I’ve never thought about “God’s Love Language.” Too often, we focus on what we can get from God instead of what we can give. Thanks for sharing this great reminder! Thanks, K. A. Blessings to you. Debbie, God has been speaking the very same message to me. Your post is a confirmation of what the Lord desires. Take a look at my post with video. I even mention the same book! Isn’t God good? He certainly is, Becky! That’s wonderful. Loved your message, Debbie. God loves us! It’s not passive love, but love in action. Your five responses are also “action” and we won’t be passive if we live out your examples. I agree with Ann’s earlier comment that parenting is perhaps the most important way that we live out God’s example in our lives. For me, the next one is service. Katherine, I like how you added to the list. Thanks so much for reading and sharing your thoughts.